Although Xining is a 1.2 million people town, cycling out of the city was easy. Most of the main roads have separate service roads that are ideal for cycling. Once out of town there isn’t a lot of traffic anymore. The next big town is Ping An where we turned south to cross our first big pass. The climb up this first pass was easy. After that it’s down and down al the way to the Yellow River. The S203 road is a bit busier but traffic is relaxed. We found a nice new hotel in Jainsha just at the other side of the river. From Jainsha it’s 15 km to another bridge across the Yellow River. From here you climb through a narrow gorge on an excellent road. The closer you get to Tongren the busier the road becomes. This traffic can be avoided by taking the old eastern road (the road we took later from Tongren to Xiahe). The old road at the eastern side of the valley is rural and quiet but very bumpy. Road quality improves after the junction to Xiahe. Few cars along this road. 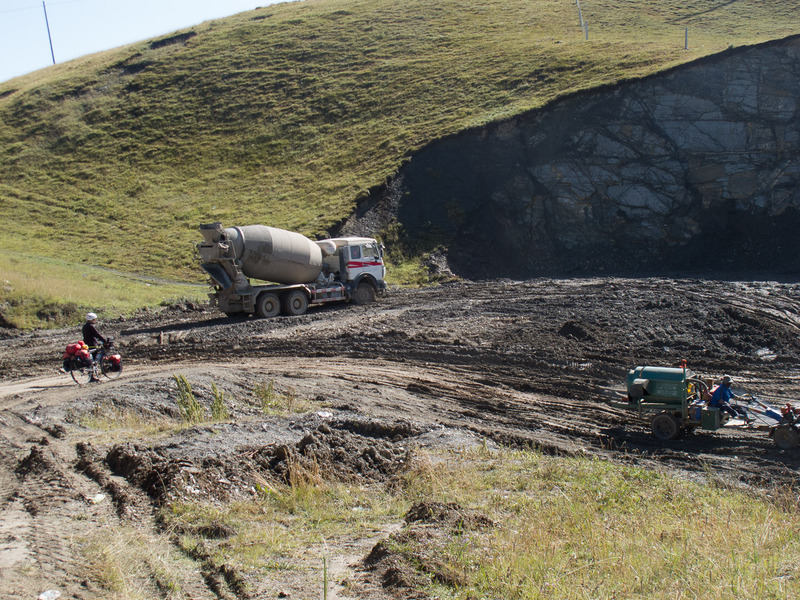 Gradually you’ll climb to a pass of 3654 m before descending to the grasslands. Here to pavement stopped and we had to continue on heavy terrain: muddy and soft after one day of rain and snow. In a couple of years also this road will be paved. Preparations where already in progress. The grasslands end with another climb up a pass (3300 m). 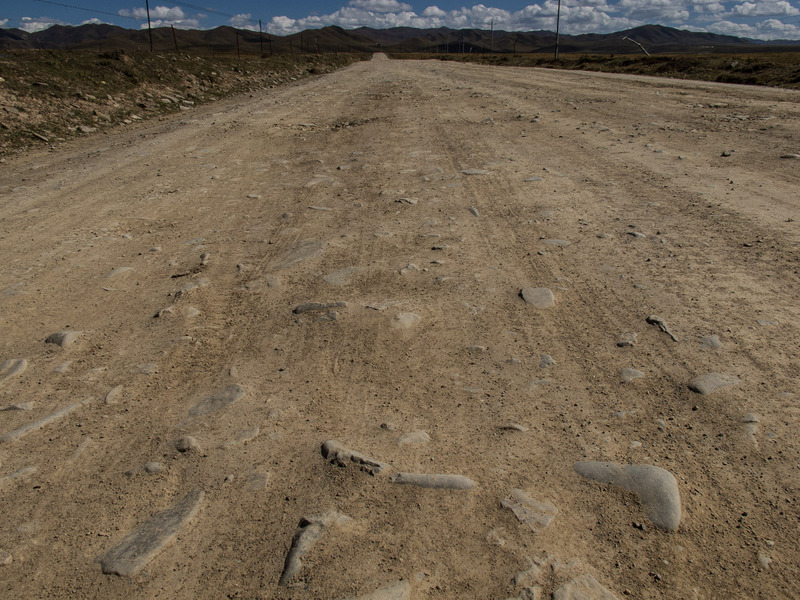 The road is still unpaved and will remain so almost all the way to Xiahe. Heavy construction work (road building, bridges etc.) on this part and in a couple of years you can enjoy a smooth ride down here. Although we started on a wide road with even an excellent shoulder, once in the grasslands aera south of Xiahe the road narrowed and became much rougher. It follows a valley and climbs some minor passes. Almost no villages here, only nomads who live in tents. The turn-off to Zekog was (surpisingly) singposted (in Chinese only). This rough and bumpy road with many potholes climbs steadily higher and higher through a wide valley. About 12 km after the sigposted junction the pavement ends. Finding a good camping spot here get’s more difficult as everything is fenced. After a camp at 3880 m we climbed the last 5 km to the pass at 4200 m; the highest point on our trip. A long descent follows on a still rough and unpaved road. Almost no traffic here. Mostly you’ll meet locals on motorbikes and very few cars or trucks. In the village of Duohemaoxiang the pavement starts again. This road finally ends on a T-junction with the Tongren-Zekog road. This wide and new highway leads to the busy little town of Zekog (shops, hotels, restaurants). A very quiet road leads north-west out of Zekog. Beautiful views of surrounding mountains. Some minor passes to climb. We took a ‘shortcut’ to the S101. Again very quiet here; no villages and only a few nomads with large herds of yaks or sheep. The wind was cold, the roads quiet, the views great! Numerous small villages with small shops line the valley road that eventually leads into Guide. In the newer part of town (at the eastern side) are several new and good hotels. Guide is very fast developing as a tourist destinations for Chinese. Plenty of hotels and eateries. The first 20 km along the Yellow River are easy to cycle. From there the wide 2-lane highway slowly climbs to the tunnel entrance (wich we did not take) or to a steeper climb up the 3860 m high pass. This old road (avoiding the tunnel) is a bit bumpy and narrow but is also very quiet. Only (local) tourists and locals use it. The top of the pass is followed by a long and spectacular hairpin style descent back to the main highway. The two-lane highway has a wide shoulder most of the way and it’s down and down all the way to big city Xining. After a detour to the Ta’er Si Monastery we continued along the old S101 into town. The last kilometers were, as one can expect, busy and congested.